Click for contact details to book your Massage. Massage is recorded as one of the earliest forms of physical therapy and was used over 3000 years ago in China, India and Greece. Massage aims to relax, revive and heal the body while reducing stress and anxiety. It also assists with relaxing muscle tissue which is extremely beneficial before a chiropractic adjustment. Massage helps chiropractic to rehabilitate soft tissue issues and injuries by delivering additional blood carrying nutrients and repair proteins as well as removing toxic elements from the muscle such as lactic acid and lymphatic fluids. It can also help take tension out of the skeleton and help reduce pain. At Peterborough Chiropractic we offer a range of different massage therapies from Shiatsu, Swedish Massage, Sports/ Deep Tissue Massage and Indian Head Massage. These massages will compliment the chiropractic treatment by relaxing and warming up the muscles in the area the chiropractor will focus on. You are also able to choose from three different essential oils depending if you would like a relaxing, uplifting or soothing / stimulating massage. Before your chiropractic adjustment we would recommend a sport massage. 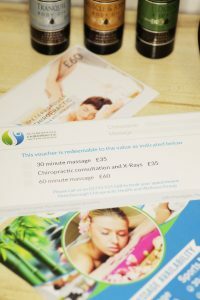 A firmer massage designed to work deeper into the muscles to alleviate muscle tension and knots in the body. Sports massage is designed to assist in correcting problems and imbalances in soft tissue, that are caused by repetitive and strenuous physical activity and trauma. The term ‘Shiatsu’ (‘shi’ meaning finger and ‘atsu’ meaning pressure) was first developed in Japan in the 1920s. Shiatsu is closely linked to acupuncture as both practices use the same theoretical roots in Oriental medicine and both aim to affect the body’s ‘Ki’ (energy) patterns. 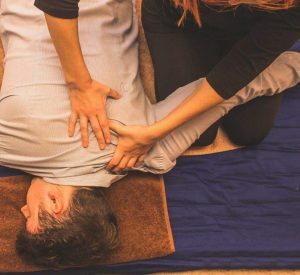 There are many different styles of Shiatsu that are practiced around the world, but all of these styles have some techniques that are influenced by modern Western osteopathic or chiropractic methods. Shiatsu is a form of therapeutic bodywork that is deeply relaxing and supports the idea that the body and mind are interconnected. Shiatsu can work on all four layers of the body; Physical, psychological, emotional and spiritual. relief of stress, anxiety and tension. help to improve sleep patterns and insomnia. During a Shiatsu treatment a practitioner will use stretches, pressure points and rocking to move and rebalance the client’s body. Shiatsu works at floor level on a futon and the client is required to wear loose fitted clothing that covers the arms and legs. This is a more relaxing option and is designed to loosen up the muscles and to help ease aches and pains. Swedish massage is the most common and most well-know type of massage. This type of massage forms the foundation for other types like Sports Massage, Deep Tissue and Aromatherapy Massage and many people book this type of massage when they would like to spend quality ‘me time’ on themselves. Indian head massage is a relaxing holistic treatment that uses a combination of massage and acupressure movements to help ease tightness in the upper back, neck and scalp. It aims to rebalance your body’s energies. An Indian head massage stimulates the flow of blood, lymph and oxygen in your upper body, and therefore can help to clear your sinuses, relieve stress and help you sleep better. It can also help to ease headaches (even migraine), eye strain and anxiety.